restylingmag.com March 2015 | Restyling & tRuck AccessoRies 37 restylingmag.com March 2015 | Restyling & tRuck AccessoRies 37 restylingMag.coM ties by making it intuitive and distraction-free," said Allen H. Gharapetian, vice president of marketing and product planning for Clarion. MirrorLink Although Apple CarPlay and Android Auto are all the buzz in the in-dash electronics market, MirrorLink, the brainchild of the Connected Car Consortium, is also bringing a useful technolog y into vehicles. MirrorLink uses soware from RealVNC (Virtual Network Computing ) to connect the smartphone to the infotainment system. e advantage to this is an agnostic user experience, so the end user can mirror their smarthphone onto the dash unit. 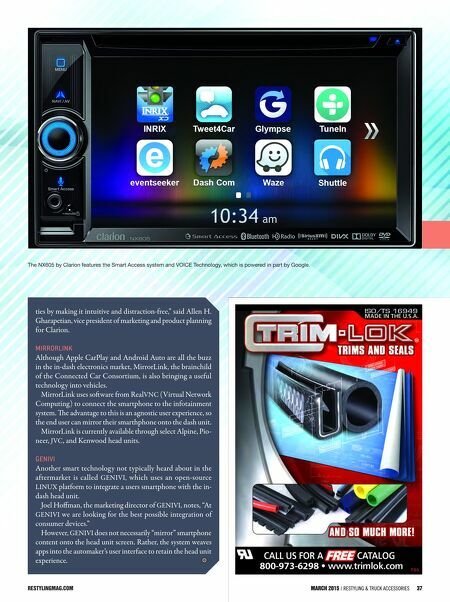 MirrorLink is currently available through select Alpine, Pio- neer, JVC, and Kenwood head units. GEniVi Another smart technolog y not typically heard about in the aftermarket is called GENIVI, which uses an open-source LINUX platform to integrate a users smartphone with the in- dash head unit. Joel Hoffman, the marketing director of GENIVI, notes, "At GENIVI we are looking for the best possible integration of consumer devices." However, GENIVI does not necessarily "mirror" smartphone content onto the head unit screen. Rather, the system weaves apps into the automaker's user interface to retain the head unit experience. 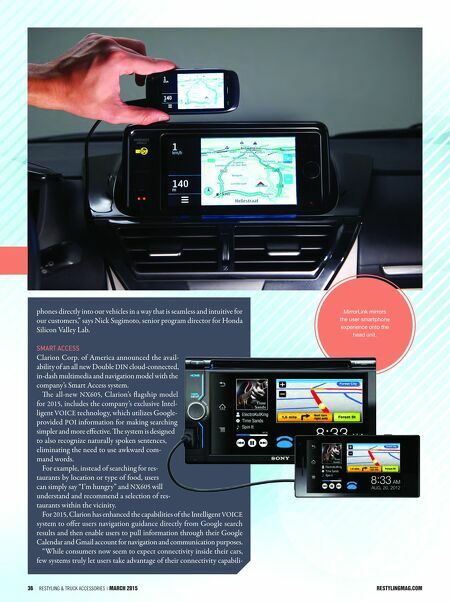 p80 The NX605 by Clarion features the Smart Access system and VOICE Technology, which is powered in part by Google.